This fabulous recipe for sweet crunchy monster cookies comes from a great baking cookbook The Amish Cook’s Baking Book . They all look wonderful and I want to try them all, one recipe at a time. I love easy cookie recipes, and these are some of the best cookies you will find anywhere. I promise. In a large bowl, cream the butter and sugars. Add the eggs, one at a time and mixing between each addition, the vanilla, corn syrup, baking soda, and peanut butter. Mix well until smooth. Add the oats and mix well, scraping the sides of the bowl. Add the chocolate chips and mix until they are evenly distributed throughout the batter. Then add the M&M’s and mix well. Drop the batter by the tablespoon 2 inches apart onto ungreased baking sheets. Bake at 350°F until the edges are golden brown, 10 to 12 minutes. Let cool on baking sheets for about 3 minutes before transferring to cooling racks. These cookies will stay fresh for up to 5 days. Makes 6 dozen cookies. 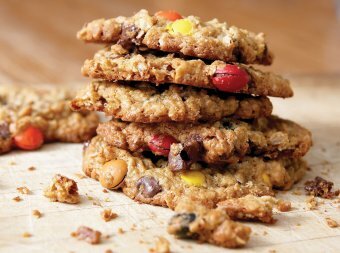 These monster cookies are just one of the sweet treat recipes we have on the site that you and your family will love. Look here for the complete list. Delicious Cookies From the Amish Cook’s Baking Book! I have ‘The Amish Cook’s Baking Book’ and I love it. I just made these cookies for the 2nd time last night and they are just as yummy as the first time. Brought some into work today and already had a request for the recipe! Awesome recipe, a definite 5 out of 5. They won’t last 5 days even in your freezer!